We have not yet reached Sri Chandranatha Basadi Temple. Time is left only to visit it. By the timewe have seen it, it will be dusk. Hari turned the car. On the way, met Ramesh Babu’s brother in law. His house is very near. He insisted not to leave without having a tea from his home. Why skip a tea, offered with love in the evening tea time, while roaming through the Wayanad forests and coffee plantations? After tea, started to the Chandra Basadi temple, which is after two plots. To the right of the temple a house could be seen. The tiled roof building, to the left of the temple, probably would be office or so. There was no sign of habitation in that. As we get down from car, a man who wore a woollen cap came out of the house in the right. He may be more than 60 yrs in age. When came closer he could recognise Ramesh Babu and greeted him. 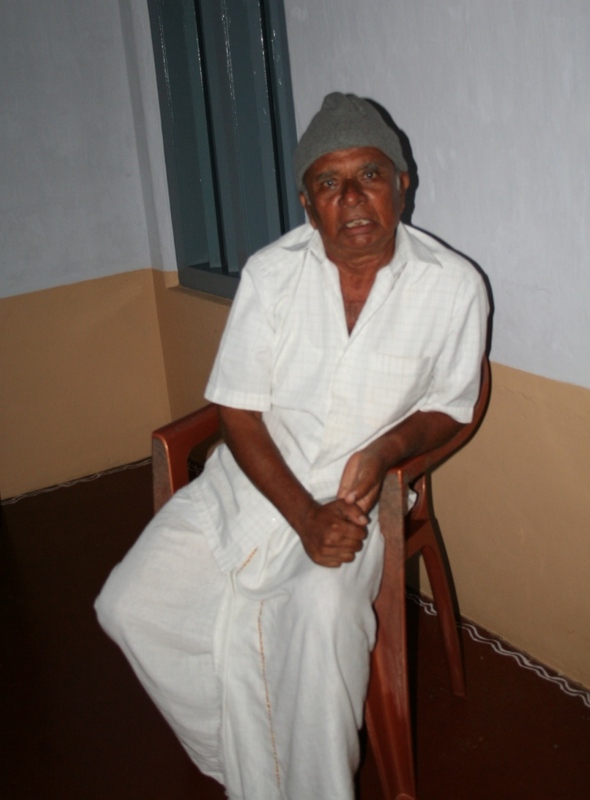 He is Ajith Sage, who is the priest of the temple. His Malayalam accent is distinct with the slang of Kannada. It seems special, understanding something in a new language, after learning it from basics. 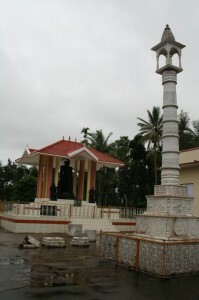 In front of the temple, a naked statue of an approximate height of 15 feet is placed on a slightly raised platform. It has climbers have crawled up through the hands and legs. The statue seems to be pictured as placed on a snake mound and hence a few snakes are also engraved on the legs of statue. 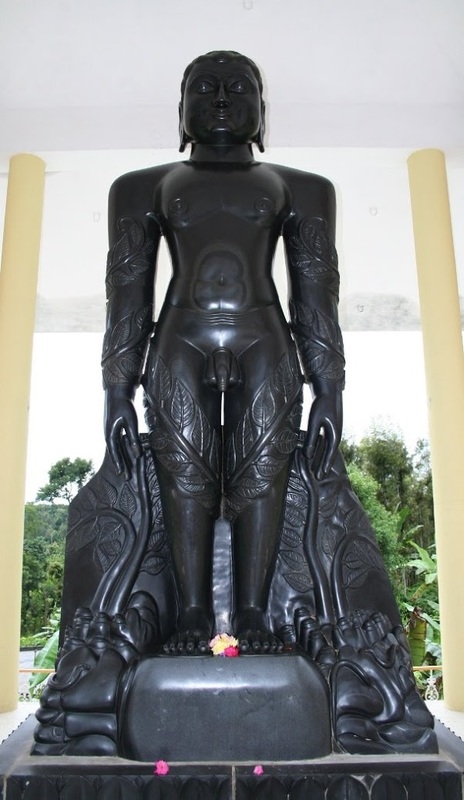 Even though I had seen the image in several pictures and instances I did not know the name of the idol. Have to accept, my ignorance in Jainism! Anyhow Ajith sage resolved my ignorance. 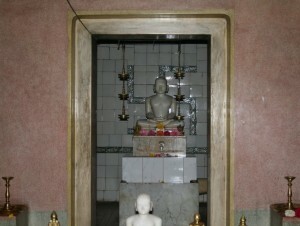 Opening the small gate infront of the statue, he invited to the front of the statue, and started telling about Jainism. 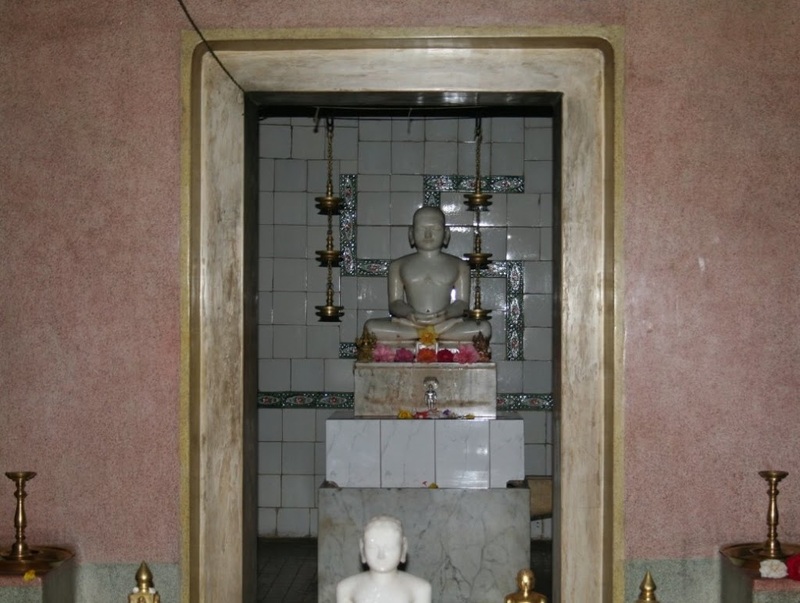 It is the sculpture of Bahubeli, who is the first man who attained salvation (‘ Mokhagami’) according to Jain belief. Ajith sage took me to the depth of new information. I was too ignorant about Jainism that I never heard of ‘Theerthankara’ or ‘ Mokshagami’ before. My knowledge on it was limited to the information from history books that Jainism has two cults “Digambara” and “Swetambhara”. Vrishabhatheerthankara, son of the king Nabhi, had two wives, namely Yashaswathy and Sunanda. Yashaswathy had 100 sons including Bharathan where as Sunanda devi had a son called Bahubali and a daughter, Soundari. 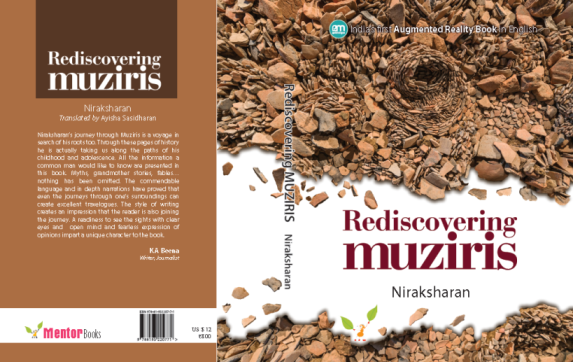 Vrishabharajan had ruled the country ideally, suggesting his people mainly 6 ways for livelihood such as …. agriculture, trade, cow rearing, sculpturing etc and helping on it. When children reached adulthood, took initiative for their marriage and other auspicious activities related to their life. Later on he had a realisation that that all his prosperity and position was indebted to the previous virtues and they would not be eternal. The eldest son Bharathan was given Ayodhya and Poudanapuram to Bahubali. Soon he chose the path of asceticism, giving the ruling responsibility of his kingdom among children. Bharatha then started invasion of the rest of the countries, which lasted many years. Most of the ally kings surrendered their power without much resistance. Out of respect for him, some kings offered their daughters as bride for Bharata. Without any bloodshed or conflicts Bharata had conquered most of the places and returned back to his capital. However, then he realized none of his brothers had surrendered their power. Not only that, every one of his brothers except Bahubali had opted for ascetic life. This caused Bharata immense grief. Even then, he has decided to have a war with exceptionally sized and arrogant Bahubali thinking, it is inevitable to complete his conquest. Despite the fact that he had a smaller army, Bahubali came to the war ground to fight, with an attitude to proudly face the outcome, either if it is a lose or win. However, realizing the fact that in the war many of the innocent soldiers are going to lose their life, the ministers of both, Bharata and Bahubali requested emperor Bharata to stop the war involving bloodshed. Instead they suggested dharamyudha without any life loss. King Bharata and Bahubali agreed to the suggestion and decided to choose the winner through three different war startegics, sightware, water war and wrestling. Bahubali, who has got better physique than Bharathan, won all the three warfare, but he was feeling deep sorrow that he had to fight with his brother. Due to the guilt feel he decided to become austere. Bahubali’s decision distressed Bharatan. However, his attempts were in vain as Bahubali’s decision was not changed. But wherever Bahubali travelled, he heard it was Baharata’s kingdom. Hearing it, his ego was hurt again. Finally Bahubali reached the termite mound of a snake. To the question, whose country was that, snake answered it was snake’s country. Gaining permission from the snake, Bahubali started tapsya (deep meditation with vows), standing in the termite mound. It lasted long and even climbers have started to grow over Bahubali’s body. However, Emperor Bharata was thoughtful about the state of Bahubali that even after long years, he did not achieve salvation from worldly cycles of death and rebirth (moksha) and could not adorn the throne of wisdom (Sarvajnapeedam). Bharathan went to father Vrishaba sage and told about it. Vrishaba replied Baharata “In Bahubali’s mind an inferiority complex still exists that he is standing in the land of his elder brother. If you go immediately and solve his problem with ego, he will adorn the throne of wisdom”. According to the opinion of Vrishaba swami Bharatan went to Bahubali and told “The blessed ascetic, give forgiveness. You are not my younger brother now, but a great austere and I am an emperor. But, I do not have peace of mind. What could cause thoughts and grief for you, who had abstained everything? If you have got any such doubts, I pray to devoid it. You would remember, here Emperor Bharata is not bowing before his younger brother, but before a soul blessed than him in embellishing goodness from past, wouldn’t you?” The doubts of Bahubali were clarified with these words and he gained throne of wisdom, attaining peace and world fame. Later, Bahubali sage attained salvation through meditation, in front Vrishaba sage. In memory of Bahubali, Emperor Bharata constructed a statue of Bahubali sage in Poudanapuram, gave information to people about his righteousness and spread fame of Bahubali. Bahubali is known as the first person to achieve salvation (Mokshagami). Along with narrating the story, Ajith sage showed the statue of Bahubali, which may cost lakhs and allowed even to touch it. The statue was made in single stone in Rajastan and was transported from there by means of road. While Ramesh Babu was praying before the ‘Mokshagami’, I was standing without knowing how to bow the deity, bemused in the enthralling historic story. I got a understanding that the other name of Indian country, Bharath, was from the name of the king Bharathan, the son of King Vrishaba, which sounded new piece of information to me. I have to accept that I had an intense urge to know the real history behind the name as, till then I was thinking the name came from the name of Bharathan who is son of Dushyanthan. Steping down from Bahubali, entered into the main temple which is on the right side. The temple which is taken care with regular worship does not seem to be very old. Inside, there is more than one deity that is not familiar. When Ramesh Babu started praying by folding his hands infront of the deity, after placing the flowers and coconut on the inner sanctum step , which he brought along, my mind also engaged in prayer. Ajith sage showed some of the snake idols in the temple, explaining its differences from snake idol in Hindu temples and allowed to take photographs until I was pleased. In snake idols of Jain temples along with the snake, there will be engravings of the god. When we finished a circumambulation and came out the temple, Ajith sage invited to have a tea from his house. Sitting on the veranda, sipping the tea, we saw the album of photos taken when statue of Bahubali was installed (Prathishta karmam). 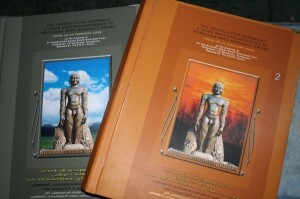 Most of the Jains in Wayand are present in the pages of the album. Slowly the talks were deviated to the agriculture in Wayanad and problems associated with it such as scarcity in the availability of labourers for cultivation and harvesting. It has started getting dark. Hari and I have to reach Manathavady, after dropping Ramesh babu back at his residence in Puthiyadam. Left, thanking Ajith sage. 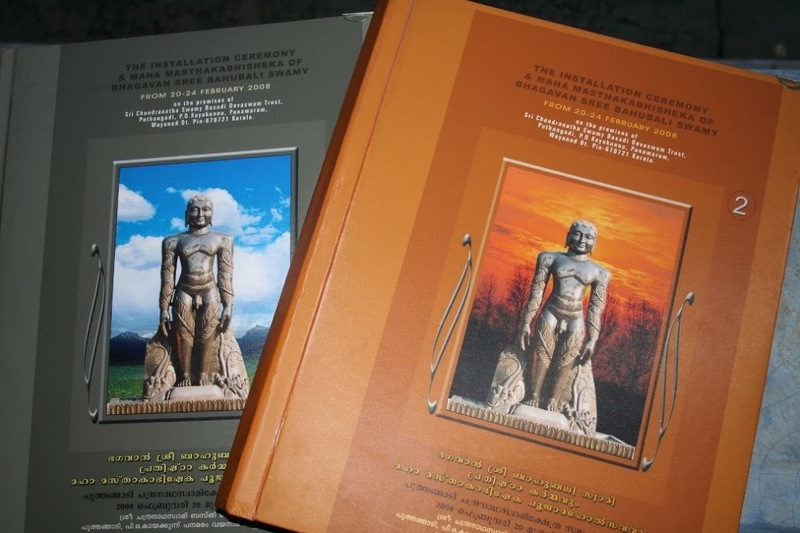 Got a few books, which includes Jainism, Jain temples and the book released on the installation of Bhubali statue, ‘Bahubali charitram’(The history of Bahubali), from the house of Ramesh Babu. They helped to provide more information about Jainism. No, not enough! Umpteen things are remaining to understand. 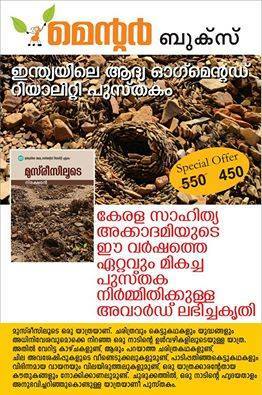 There are a lot more Jain temples, in Wayanad and other places of Kerala. Have to go everywhere, have to understand everything. I decided it in my mind, while the return after leaving Babu, back in his home. This journey may lead to Idakal cave, Kallil temple, Thiruchiral hills…….etc. 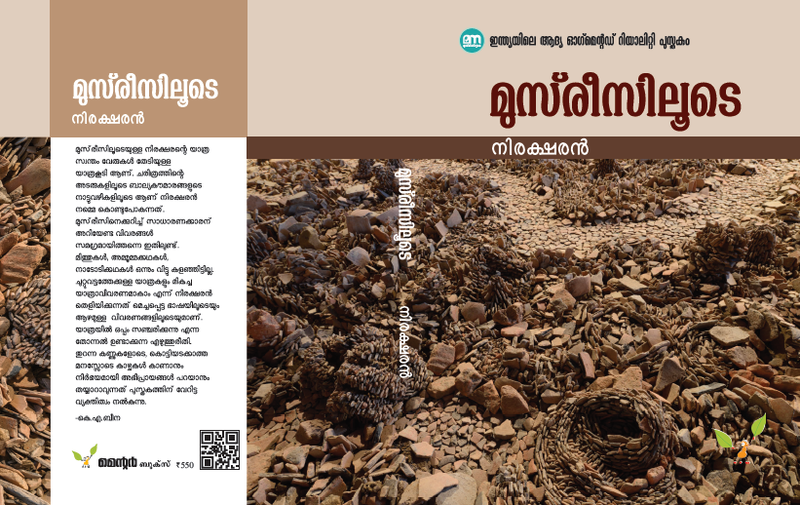 Translated from my Malayalam travel blog ‘Chila Yaathrakal‘ by Miss Anu. well translated, all the other travelouges in this series also deserved to be translated along with this……. Nice to read your work in English. I have a doubt in the caricature given at the sidebar under the title “We are on a Trip” made me to laugh. Well done Srinivasan, but a small doubt hey you both are sitting or standing on the seat, it looks like your B/H is about to jump from the car and the car’s face shows a bit sadness, whats the reason.